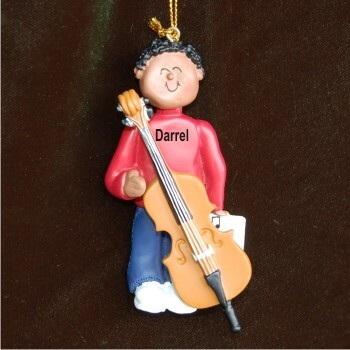 Beginners and first-chair performers alike love the cello virtuoso African American male personalized Christmas ornament that's offered in other looks too. We hand letter names and the year on these handsome musical instrument ornaments personalized to bring added pleasure to the recipients. The male African American cello player personalized Christmas ornament features a display cord and our exclusive velvet gift and storage bag.